New Orleans rapper Curren$y is known for his laid back rhymes and relaxed attitude, but believe it not, he actually knows an awful lot about lowriders, too. 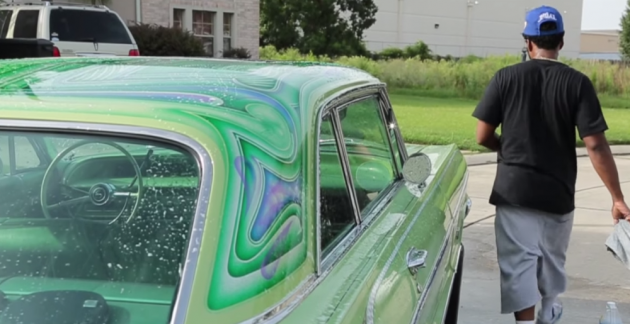 The rapper showed off his custom painted 1964 Chevy Impala in a video interview he did for hotnewhiphop.com. The New Orleans native said he bought the ’64 Impala off of eBay, already equipped with a hydraulics system, but said he still needed to add a few personal touches. Lowriders gained popularity following the end of World War II as many financially able Americans were buying news cars and getting rid of their old ones. Americans with less money were buying these used vehicles, then adding their own personal touches with modifications like custom paint jobs, hydraulic systems, or new rims, which allowed the cars to sit lower to the ground. One of the biggest modifications Curren$y made to his Impala was the candy coated paint job. The green, purple, and blue swirls on the roof are the colors used on the covers of his three most successful rap albums. The 34-year-old rapper may not run around in the spotlight anymore with Lil’ Wayne and the Young Money crew, but that hasn’t put an end to his one of a kind style and unique taste in cars.